From Liverpool to Hamburg to points circling the globe, the Beatles electrified audiences, and, well, you can insert your own hyperbolic statement about the redefinition of a rock show here. Yet on January 8, 1969, 28 months since they last played proper a live concert (alternately: “only” 28 months since they last played a live concert), Beatlemania was a memory as the group searched, still, for the how and where of their upcoming live TV concert. 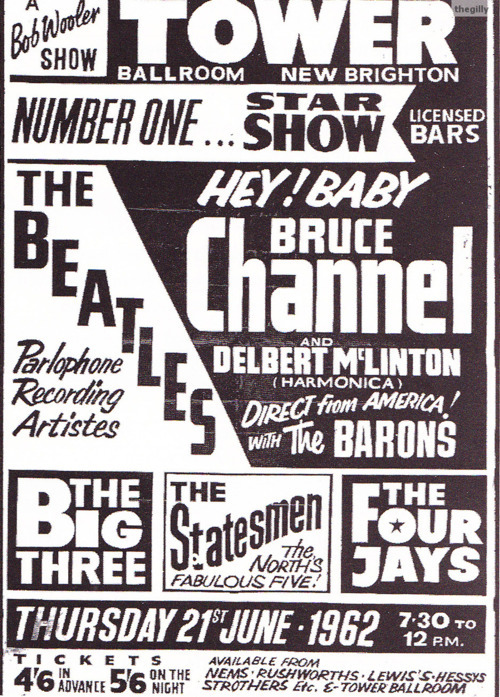 The Beatles’ performance of “Hey Jude” on “Frost on Saturday” that was aired nearly four months prior to the day was their new baseline. It was nothing compared to the ideal, the best in the business. 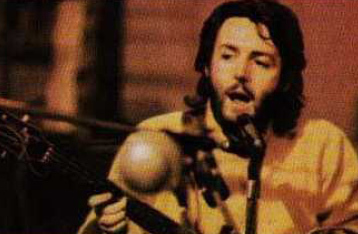 Paul’s tune was unchanged several decades later, when he told Uncut in 2004 that Brown was “sodding fantastic,” while understandably saying he’s more of a Beatles fan, ultimately. OK, stack us up against James Brown, record for record, he’s definitely hotter because he’s James Brown. But he didn’t do the stuff we did. He’s James Brown and he’s sodding fantastic. We can all agree on that. But there’s something else to The Beatles. Look, we did a lot of good music. You look at Revolver or Rubber Soul, they are decent efforts by any standards. If they’re not good, then has anyone ever been any good? Because, if they’re not good, then no-one has ever really been that good. George, who would write in his 1980 autobiography that his favorite cover of “Something” was in fact by Brown, wasn’t quite so much a fan of his act, at least, in the opening days of 1969 — which was when, coincidentally, “Something” was in nascent form. Paul and Ringo parodied Brown’s “cape routine,”Paul pleading, “Come back, Ringo, come back!” “I can’t do no more, man,” Ringo moans in response. With Paul having already mentioned earlier that morning the suggestion of “[opening] the doors [to the audience], and we’re in the middle of a number,” Lindsay-Hogg — the director of the “Hey Jude” segment — wondered if the band shouldn’t be awaiting the audience’s arrival. “It’s all collected and you’re all together, then you start, as opposed to you coming on as the Beatles, it’s like much more intimate and participated that you’re there. Rehearsing “Hey Jude,” September 1968. Lindsay-Hogg wanted nothing to do with Twickenham — or anywhere in England — as a concert locale, but this early in the sessions he’s at least showing signs of a vaguely open mind and understanding the final decision won’t be his anyway. “Maybe we should have,” George chipped in. The discussion shifted to the potential decriminalization of pot — sparked from a reading of the daily papers and the Wooton Report — and it’s around then John finally arrived and joined his mates as George said he was keeping his guitar warm for him. The band’s all here, and a loose warmup began with some R&B — alas, not James Brown, but an improvisation led by Paul that name-dropped French fries and sausages that evolved into a song from one of Brown’s early contemporaries: Big Joe Turner’s “Honey Hush.” It was a song Paul later recorded for “Run Devil Run” and John rehearsed with Elephant’s Memory before his 1972 concert in New York, if the bootlegs are to believed. “Honey Hush” wandered into “Stand By Me,” a song very definitely covered by John for “Rock ‘n’ Roll” in 1975 and his last single before his comeback in 1980. This time, Paul was on vocals, and he gave it the same grandiose treatment he delivered on “I Me Mine,” adding a little “The Barber of Seville” flavor for good measure. As the Beatles continued getting loose, a mention of one Harry Pinsker led to a cheeky rendition of the “Hare Krishna Mantra” with the Apple Records accountant in the lead role. The Radha Krsna Temple (London)’s version of the chant, as produced by George Harrison months later amid the Abbey Road sessions in the summer of 1969, peaked at No. 12 on the U.K. charts. 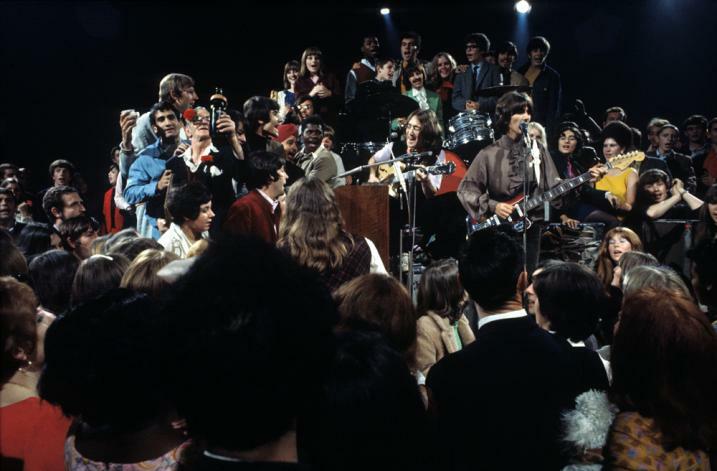 As they wrapped their approximation of the chant, and with discussion of staging ongoing, the Beatles began their first sincere stab at a genuine run-through of their new songs. If you’re seen the “Let It Be” film, you’ve seen much of that performance. “The bad example is going away,” Lindsay-Hogg replies. An overseas adventure has been nixed several times already, and was about to be again. But less than a week into the sessions at Twickenham, the director wasn’t ready to let his dream concert die. How could the band resist playing in the fresh, open air? MLH. Pow, there you are. And pow, what are you going to do with it? And pow, it’s going to be fantastic. That was pow, you see. And we ain’t got no pow at the moment. Paul: The only thing about that is [pause], we don’t want to go away. A group decision. For George, the refusal to go overseas goes beyond Ringo’s veto. The logistics would be overwhelming. Complications are all the more reason to go that route, Lindsay-Hogg says. Go big, and don’t put together a show like Cream’s. And if Lindsay-Hogg is going to stage a Beatles extravaganza, he’s made clear he wants precisely 2,000 Arabs in the audience. Apparently, no more, no less. MLH: Visually, the thing that worries about here, it’s going to make it look like Cream, with a couple shots held a bit longer. .. If we went away, we’ve got the enormous plus of the visuals. Think of a helicopter shot over the amphitheater, with the water, with the lights. Torchlit, 2,000 Arabs. Visually, it is fantastic. Therefore, that was a challenge. And you see, I just myself am trying to think of any other framework to put us in to make it work. But it does really need a framework. And it doesn’t need to be done in just the back of an auditorium. George, those kinds of obstacles are kind of good. I don’t mean this in any sense of discipline. I know you’ve done it all, but maybe you haven’t been there. Its a very difficult thing once you are, you to create false obstacles, because what you’ve been trying to do for five years is eliminate obstacles. You don’t want to play the show in straitjackets, that’s the wrong kind of obstacle. … At the moment, it is too soft. Paul’s memory of a night in Wimbledon steered the conversation to a Beatles gig in late 1963, when they played a fan-club show that included a meet-and-greet with the 3,000 fans. In his 2006 memoir John, Paul, George, Ringo and Me: The Real Beatles Story, Beatles PR man Tony Barrow recalls the event. 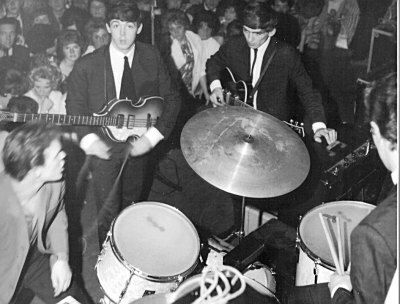 After these close encounters with the Fab Four, the fans were treated to a special stage show in the main ballroom area where an over-protective Palais management had constructed a high-walled metal cage inside which the group were to perform on an extended makeshift stage beneath a huge banner that screamed: WIMBLEDON PALAIS WELCOMES THE BEATLES. Welcomes? The cage didn’t make it look like that! At Twickenham, George remembers the night as “hell.” And no wonder Lindsay-Hogg is having a problem getting traction for a “different” kind of Beatles show, when their past is dotted with experiences like this. Despite calling that night “terrible,” Paul offers an opening. Lindsay-Hogg brings it back to the “Hey Jude” promo. “Really would be great for us to get something, a serious intent,” Paul says. “Say we were all very charitable. Which we’re not, particularly. But say we were really sort of charity nuts…” And then the tape cuts off, before picking up after a roll announcement. 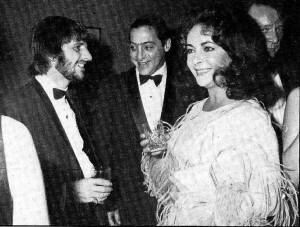 The group had in fact done a few shows for charity — the Royal Variety Performance most famously for its jewelry-rattling. It wasn’t until their solo careers when charity work and concerts became part of their fabric, led by George and his pioneering Concert for Bangladesh. Now, desperately searching for a catch, they stumble into the idea of playing for a greater cause merely because it would be a unique hook. A remark by Lindsay-Hogg about pop-culture heroes sparks an animated monologue from Paul about a recent telecast of “Late Night Line-Up,” a live, late-night talk show with a focus on the arts that wrapped BBC2’s programming day. 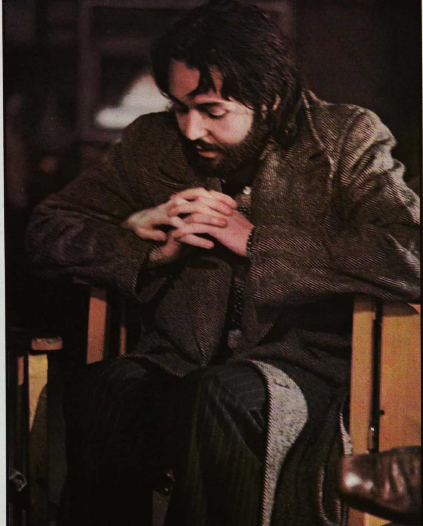 The particular episode — Paul described at once as “incredible” and “wasn’t very good, but it was pretty good” — saw students given the keys to the show, with one segment featuring the camera zooming in and out on a man watching himself on a monitor drinking tea as “Revolution” plays in the background. A joke from Paul about the potential of staging the show at the Houses of Parliament — “we tried for the [Rock and Roll] Circus; they didn’t go for it” was Lindsay-Hogg’s reply — led to another thought that was quickly passed over. But it foretold one of the greatest moments in popular music history, one which was only three-and-a half weeks away. 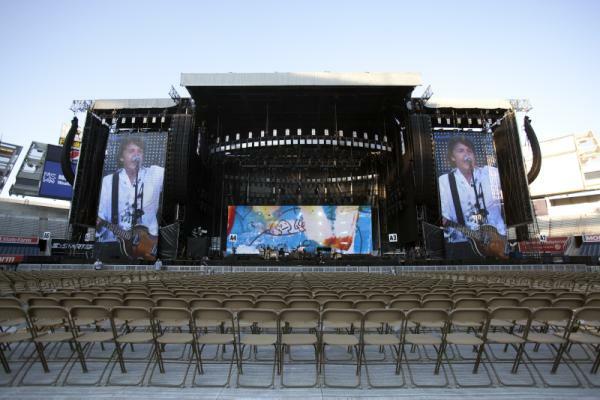 “We should do the show in a place we’re not allowed to do it,” Paul suggested. “We should trespass. Go in, set up and then get moved, and that should be the show. Get forcibly ejected still trying to play numbers. And the police lifting you. Lindsay-Hogg simply brushed it off. The lengthy early Jan. 7 discussion resumes in the next post, here on They May Be Parted. Last Monday brought the news of the death of longtime TV interviewer David Frost. There are far better places to read about his life and career, including the several times he hosted and interviewed The Beatles together and individually. But a specific moment in Beatles history with a tie to Frost, one touched on plenty on this blog, is worthy of its own post. It was 45 years ago today — Sept. 8, 1968 — ITV’s “Frost on Sunday” variety show debuted the “Hey Jude” promotional video, which was filmed four days prior. 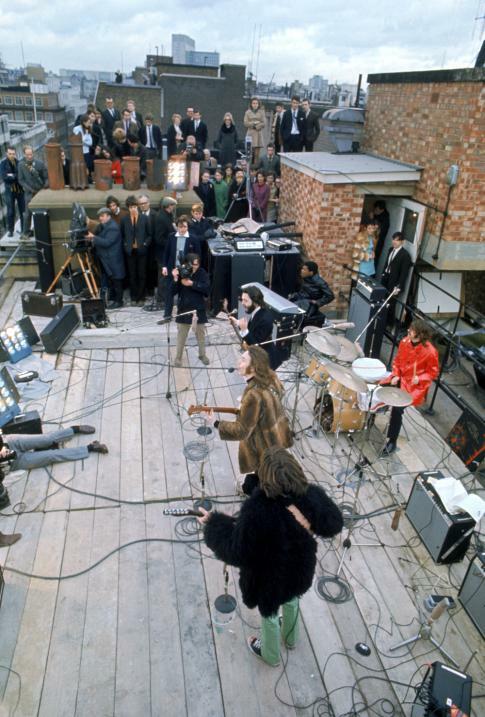 The performances — they filmed three complete takes of a dozen attempts total — along with the rooftop show nearly four months later, marked the only times The Beatles would play together to a live audience after they stopped touring in 1966. Michael Lindsay-Hogg, who had last worked with the group that same year directing “Rain” and “Paperback Writer,” was hired again for the shoot at Twickenham. And with the formal introduction is Frost, who is serenaded, primarily by John, with the show’s theme song (which, as it were, was written by George Martin). The “greatest tea-room orchestra in the world” really does stage an inspirational, iconic performance. OK, so they weren’t really live, playing with an actual orchestra in the house over a recorded track with Paul double-tracking himself in parts and adding freshly scatted vocals during the extended outro. Musician union rules had forbid a strictly lip-synched act. It’s a new generation of Beatlemania on display here in this new phase of the Beatles’ career. Gone are the screaming fans drowning out the group, instead replaced with the 300 guests encircling then and joining the coda’s chorus. Lindsay-Hogg captures the fresh, optimistic tone of the song, and the band’s jubilant mood, with a clip to match. Things almost get out of control, but never do. It’s perfect. (For a fun bit of frivolity and another bit of Get Back session foreshadowing, listen in during the coda in the above clip for Paul quoting “The Weight” by The Band at around the 6:20 mark — they were already serving as a bit of inspiration). A great first-hand account of the day from audience member Marc Sniden — the “geek with the horn-rimmed glasses and school blazer behind Ringo” — was published in a 2009 article in the Liverpool Daily Post. They just walked in holding their guitars, then walked round and shook our hands saying, ‘Hello, I’m John’” he says, still incredulous at the memory. “It was the days of screaming, but nobody screamed. We were suddenly in the presence of God. That’s the only way I can describe it. These people had changed history. We grew up with them. Marc says they were almost telepathic as a band. But, as the afternoon wore on, even they became fractious. While the song gave The Beatles a monumental hit song to launch Apple Records, the experience of the performance also had its own significant repercussion: The band was open to playing before an audience again. And thus, the seed of the idea for the Get Back/Let it Be sessions was planted, before they’d even completed recording the White Album. The Beatles would be back at Twickenham with Lindsay-Hogg and producer Dennis O’Dell in less than four months time. The clip would be a cited repeatedly on the Nagra Tapes as a benchmark for what they were trying to achieve, be it the composition of the audience, the focal point of the camera or the location of the show. 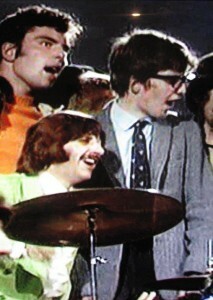 Just a footnote in Frost’s long career, the “Hey Jude” promo filming proved to be a pivotal moment in The Beatles career. Quick quiz: When the Beatles convened Jan. 2, 1969, at Twickenham for the Get Back/Let it Be sessions, what was their most recent record release? It wasn’t the “Hey Jude” single, which was still on the charts , but came out the end of August 1968. It’s not the White Album either — that came out at the end of November. The soundtrack to the Yellow Submarine film was released nearly two weeks into the January 1969 sessions, with songs that had long been recorded. Check the solo discographies, even, and you come close — but not close enough. Two Virgins — cut in May — came out a week after the White Album. John also participated in the Rock & Roll Circus on Dec. 11, 1968, but that recording wasn’t released until 1996. George’s Wonderwall Music was close, too, released Nov.1, 1968 in the U.K. and Dec. 1 in the U.S. The answer, a giveaway by now thanks to the post title and above image, is the Beatles’ Sixth Christmas Record, recorded post-White Album sessions in November 1968 and released Dec. 20, 1968, less than two weeks before the band assembled at Twickenham in Jan. 1969, and while the band was in active discussions planning out the film and potential shows. There’s no need for a play-by-play breakdown of the recording, since if you’re at this blog, you either already have heard it or, if not, you really should just click and listen — it’s less than eight minutes long. Does it portend anything musically for the band? Well, no, not at all. It’s odd and experimental in (most) places. 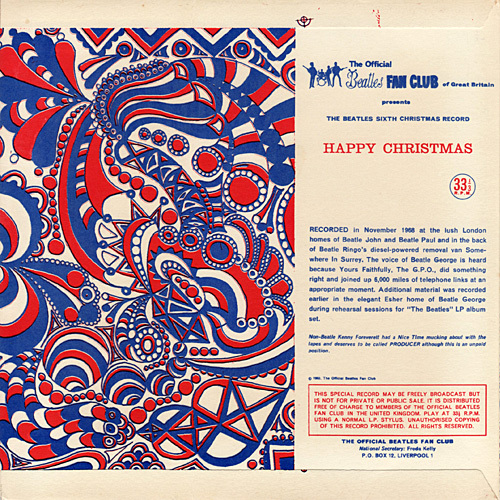 But perhaps more relevant, this is the first of the fan-club-only Christmas releases, which date back to 1963, in which the group wasn’t actually a group, with each of the four members submitted their own message for inclusion. How separate were they? 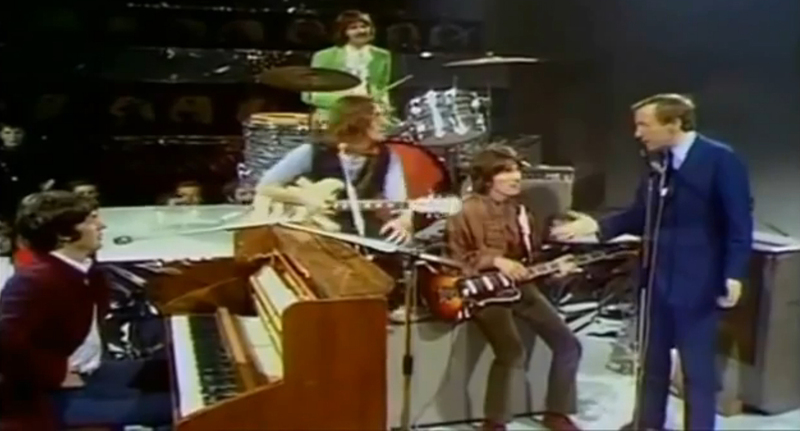 It was an international affair with George literally phoning it in from L.A., while the rest of the band put their respective pieces together from their homes. Alas, they were forced back together again days later at Twickenham, but by the time their following (and last) Christmas album came out in Dec. 1969, they’d be done recording as The Beatles, separately or together, altogether (one exception aside). Even the most casual rock music fan knows how the Let it Be film ends, even if they’ve never seen it or even if they’re not really Beatles fans. The sight of John, Paul, George and Ringo trying to pass their audition on the roof at 3 Savile Row isn’t merely an iconic Beatles moment, it’s an iconic moment in popular music history and pop culture itself. Watch the movie, and there’s never an inkling that wasn’t the plan all along. Less than three years removed from their last tour, the group rehearses some new songs, then when they’re ready simply climb the stairs and rock from the roof. It’s just like they planned it all along, right? Of course not. And right here’s another reason why I’m loving listening to these tapes and find them so valuable — it’s not just to hear the songs in progress and rehearsed in context or to hear songs they threw away or just shelved until they could revisit as solo acts. It’s to hear a conversation like one we hear a few hours into Jan. 6, the kind of thing that never made compilations of the sessions. I keep getting back to my need to operate within context throughout this blog. So we know the end of he story: the rooftop show. But how did they get there? We get an incredible glimpse here. After exploring George’s “Hear Me Lord” and knocking out a few covers, conversation shifts to the planned live show, a topic promised earlier by director Michael Lindsay-Hogg and just touched upon in the prior days on the tapes. And there’s an awful lot going on here in what’s marked “Dialogue,” 14-plus music-free minutes, the 53rd track on the Jan. 6 collection of Purple Chick’s A/B Road. Two figures that loomed so large in Beatles history — George Martin and Yoko Ono – make their first significant appearances on these tapes. Ono would remain key to the story of Get Back/Let it Be. Martin would not. Well, he would be, ultimately, quite conspicuous by his absence. But it’s not necessarily the people involved but what they’d discuss that makes it a memorable sequence. The endgame here, after all, is a live show, even if they have no set plans for one in place. Yoko begins the conversation – on the tapes, at least, where after a quick cover of Chuck Berry’s “I’m Talking About You” (a song they used to play in Hamburg), we join the chat in medias res. Yoko’s first suggestion is for the Beatles, who four years prior played before more than 55,000 in their iconic Shea Stadium show on Aug. 15, 1965, to have something of a more modest audience. Yoko: “…[have a] stage, you know, and it’s like an open-air something, and you’re playing to the gods! You know, and to the stars. While Paul’s agreeable to the suggestion — or at least something avant garde — Michael Lindsay-Hogg tries to push another angle for the live show involving all those seats being filled by actual people, even if they’re not necessarily fans of the Beatles. But Paul — quite the veteran of the stage even at this young age — sides with Yoko. Enter George Martin, who joins Team MLH after some indistinguishable crosstalk. George Harrison is there too, and at this point, I think he says that “It’ll be just our luck to get a lot of cunts in there [at the show].” Perfectly reasonable thought. Lindsay-Hogg gets things back on point, reminding the band that once they’re on a stage, they’re performers. After agreeing with Paul, Yoko says people are wondering what makes up the audience in this post-Beatlemania world before continuing to pitch the actual lack of an audience. Yoko: “It should be like the invisible, nameless everybody in the world, instead of some teenager or something, and they say, ‘Oh, so they still have that teenage audience.’ Or if you have costumed people they say, ‘Oh, that’s the audience now.’ It’s very dangerous. Sunday and Monday shows. Of course. And here we have the sessions in a nutshell: The band is doing a show with songs they can’t agree on and haven’t finished writing and at a location — possibly international — that hasn’t been determined. BUT. They do know they’re taping two shows, to the point where they know it’s a Sunday and a Monday. The devil’s in the details, not only in her heart, it appears. 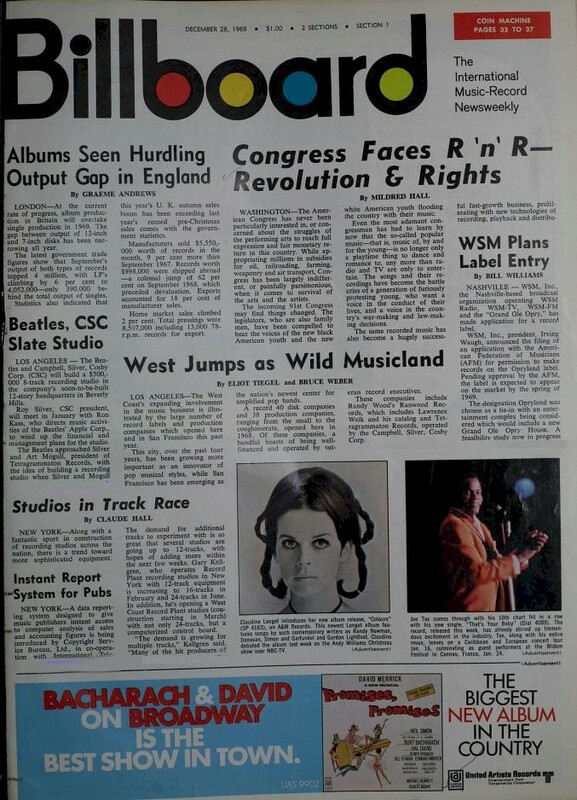 Tune in next post, where we continue this Jan. 6, 1969, conversation about the forthcoming show.